Indulge yourself in rich,creamy,nutty and flavourful Pista Milk Shake!! The colour itself looks Inviting!! Take a pan and boil milk,boil till it reduces to 1 and 1/2 cups.Allow it to cool. 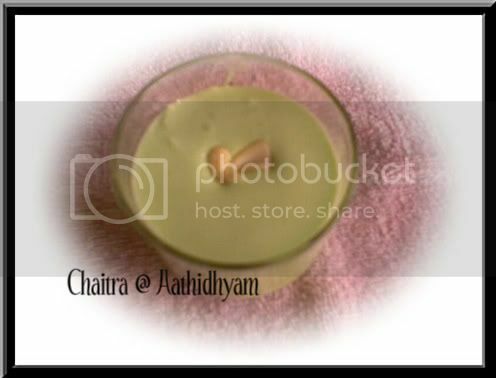 To this boiled milk add pista, almonds, sugar, cream,cardamom and grind this mixture. Pour this into serving glass add roasted nuts and refrigerate it. Well i found procedure-1 easy and convenient. Sending this to FIC -Favourite hosted by Curry leaf and Sunshine Mom as my favourite colour is Green. Sending this to Soup N Juice Event hosted by Sireesha of Mom's Recipes. 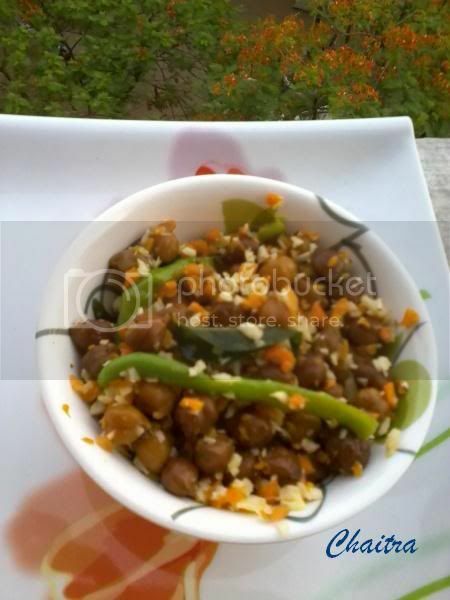 Me and my sister were going through Chandra Padmanabhan's Dakshin.Suddenly on page 100 we saw this recipe-Sundal(chick peas salad).Then my sister reminded my mom that she was asking for this salad from the past ?? 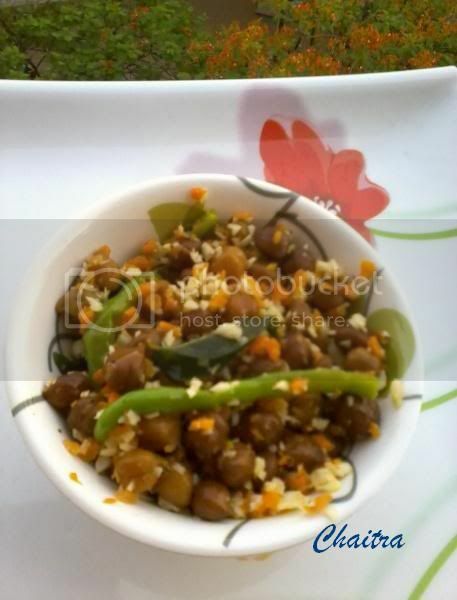 ?.Immediately without second thought she soaked chick peas that day itself and finally Amma had to make it.I am glad that she enjoyed eating this.To make it colourful amma added grated carrot,onion and raw mango. Soak chick peas overnight and pressure cook them. Take a kadai, heat oil and fry all the seasoning ingredients.When mustard seeds splutter, add boiled chick peas. Now add grated carrot, green chilli,salt, red chilli powder, raw mango pieces and onion.Mix all these ingredients well. SUGGESTION -You can replace chick peas with boiled ground nuts/peas. Simple and very tasty broken wheat halwa!! Heat one tbsp of ghee in a kadai and fry cashew nuts until golden brown in colour.Off the flame and keep it aside.To the same kadai add broken wheat and roast them for about-3-4 mins.Now add 4 cups of water and cook for 5-10 mins.This broken wheat should be cooked properly.Now to this add grated jaggery and sugar.Allow sugar and jaggery to caramalize.Now add 3-4 tbsps of ghee.Dont compromise with the amount of ghee,if you want you can use more.Once this mixture thickens off the flame,add cashews,stir this mixture well and then transfer this mixture into serving bowls. Pour this mixture onto a greased plate and cut them into desired shapes or else you can make them into golf sized balls. 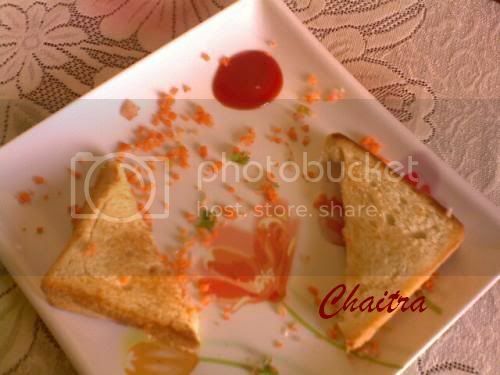 This was my first recipe.I was doubtful when i made this sandwich.All my sister could say that it was OK.Later on i tried different combinations and finally made it one of my sister's favourite sandwich.I came across this recipe in a news paper where the initial version contained only cheese,salt and green chillies, which i dint like, after so many corrections, i mean additions-deletions etc.I got this sandwich perfectly.Why dont you try?? Take a bowl and mix all the above said ingredients well.Slightly toast the bread slices.On one side of the bread slice layer the above filling and place another bread slice on it. 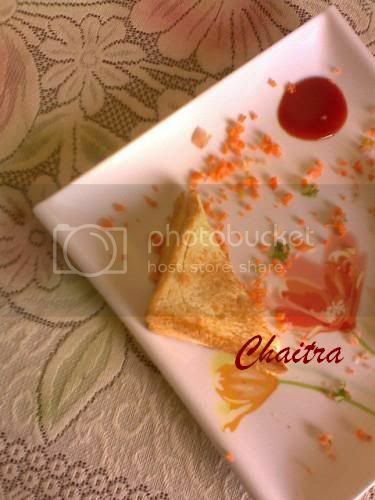 Thats all your chilli cheese toast is waiting for you. This refreshing summer chiller comes to you all the way from Godavari district i.e, Rajamundry. During our visit to the market place there i have seen one small shop over crowded with so many people drinking something colourful and some eating red and yellow mixture.It all seemed to me funny and out of curiosity i asked my dad what was it?Then he said that all those people were waiting for their turn to have Rose milk and flavoured vermicelli milk.When he asked me whether i would like to try i said no way.But when he and amma insisted i had to say Yes.But let me tell you after one sip i totally got addicted to it and from then on whenever we go to Rajamundry dad makes it a point to take me there and that small shop is famous for Rose milk. Last week when thatagaru came from Rajamundry he bought this Rose syrup for me and guess what i am into !!! Refrigerate milk for 2 hours. After 2 hours remove it, add sugar and grind it by doing this you are making it frothy. Meanwhile you can boil vermicelli and allow it to cool. Take serving glass and add rose syrup, boiled vermicelli, nuts and milk-sugar.Blend all these ingredients well and serve.e. 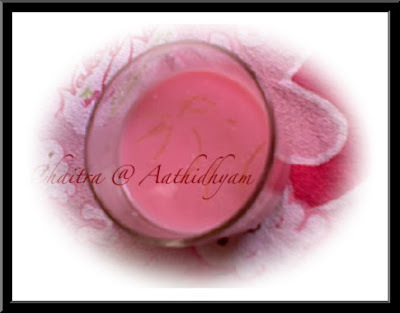 NOTE-For simple rose milk you can remove vermicelli from the above list. But i love simple rose milk version not just because i am lazy but i dont like vermicelli. 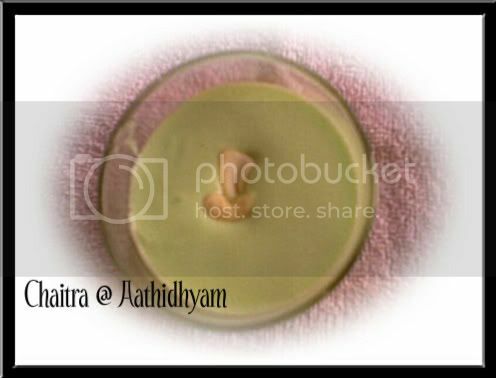 You can also add boiled sago palm/saggu biyyam. 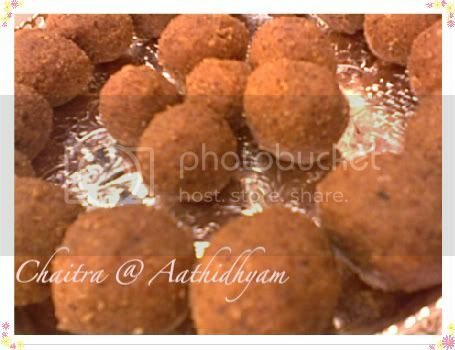 I am waiting to post this recipe.This is truly traditional sweet of Andhra.Amma use to give me and M one laddu per day by saying that it is very healthy.Really i suggest if you have kids give them atleast one per day and i am sure they will love this it because of its unique taste.Topping it is its nutritional values. 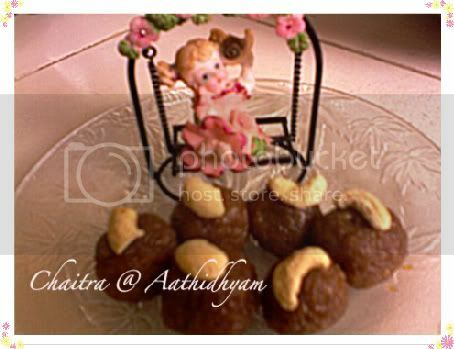 This laddu is prepared on special occasions. Trust me you will never forget this taste. First take a thick bottomed pan and roast urad dal until golden brown in colour or untill you get that pleasant roasted smell.Off the flame and allow it to cool.Now grind roasted urad dal along with grated jaggery into fine powder.I mean you should get sandy texture.Meanwhile take another kadai and melt ghee.To this add roasted urad dal and jaggery powder.Mix well.Remove from heat and make them into small golf sized balls.Add ghee if necessary while making laddus. NOTE-Instead of Jaggery you can use sugar also. Simple Andhra pickle.Very tasty and can be served with Morning Tiffins as well as evening snacks. Wash,peel and pat dry ginger and then chop them finely.Soak Tamarind in hot water.Grind ginger,red chilly powder,salt, sugar and tamarind into a fine paste.Take a kadai and fry all the seasoning ingredients and then mix it with Ginger chutney. Exotic Indian cuisine and authentic flavours from all over the World!! 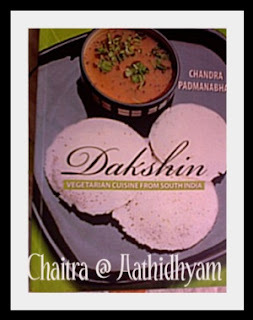 This blog promotes Vegetarianism and Andhra flavours! !If you like this blog why not subscribe for the same? Thanks for visiting my Guest page.Please feel free to share your Comments,ideas,views, suggestions! !